These are some restorations, custom cabinets, mods and custom builds I have done. If you are interested contact me and I can give you a quote on many of the custom builds. The British Custom 7 at top a cool 1x12 slanted cab. The slant make the cab easy to hear on a stage or standing up. Here’s a cool vintage Traynor Reverb Master. It’s kind of Traynor’s version of the Fender Blackface series. After new caps, some new tubes, and an adjustable bias system installed it sounds great! Here's a new custom build. It's two channel amp with a Hot-Rodded JCM-800 channel and Vintage 60's Plexi Channel. It rocks! It's 50W but with four El-34 so it feels and sound like 100W. I rarely do channel switching amps because there only certain circumstances where they can be built without the compromises that result is the dreaded "only one channel sounds good" syndrome. This one has completely separate pre-amp circuits for both channels and the gain stages have individual filter caps eliminating the veil of the inter-modualtion distortion so many hi gain amps suffer from. I received it on Saturday and between having a lot of company over the weekend, and playing it I haven’t had a chance to email you and thank you for such a fine job! The thick switch threw me for a second because it’s such a subtle change in tone, but when I kick it in and use my neck pick ups it does exactly what you said it would do,, and those ‘Carlos Santana liquid leads’ are awesome! As for the clean channel,, that was a perfect call on using the plexi circuit for that channel! I LOVE the sound of it! It is so crystal clear and beautiful sounding that I can’t even begin to explain it with words but it is exactly what I was looking for! Also, I have a couple of distortion pedals that I experimented with on the plexi channel, and when I threw those babies on it,, it was reminiscent of those deep,, ballsey, face melting heavy metal sounds I got from an old Mesa Boogie roadster amp I used to have and that was something I really missed about that amp that I never could quite get out of my Marshalls. Way Cool!! I also noticed that you added a couple extra little bells and whistle‘s to add to the tonal possibilities of this amp and wanted to thank you for that as well. So In closing, thank you for your hard work, your time and your dedication to perfection, you have earned yet another very satisfied and happy customer! My Very Best Regards to You! This repair was a chore but the amp sound pretty good now! The amp had been built poorly to begin with and they used a bunch old/bad parts so the amp humed like crazy and made squealing noises. Once everything was changed out and number of signal and basic safety concerns where taken care of it’s ready to play! Two Rock inspired amp made to do big smooth cleans and be a pedal platform. However it's far more than clone. It got Variable Power so that it can go from a full 50W to 1/10W for cranked tone at any volume. It can use most Octal power tubes for additional tonal textures. It has SAG control that allow you to dial in the feel of the amp and a bunch of voicing switches (like most Dumbles) but includes one of my own devising to allow to get more sparkling Fender sound than can be had stock. There are lots of sounds in there! The cabinet is a detuned cab with single Weber Michigan 12 which is similar to the EVs Dumble often shipped his amps with. Here’s a 4x10 Cab I built for harp player! Pine and oak with Weber 10A125Os! This one was really fun to build. I did for long time customer and friend. It's my Octal Princeton but with fancy hand finished cab made of pine and oak. The front pieces on the head are salvaged from pallets. The 2x10 cab is loaded with Weber DT10s. In keeping with the look I made the baffle with oak strips as cone protector rather than grill cloth. The finish was 15 coats of a wipe on varnish I mixed up. Lots of work but I'm pleased with the result! “Loving this amp my friend…It’s just perfect! I can now die a happy bottleneck player! I can’t see myself ever needing another one in this life! we’ll chat later about the great harp amp you’re gonna build for me! This head and cab is Blackface Champ with number of mod: variable power, tube swapping capable, and eq lift. The cab is loaded with Alinco Weber California. It a small but toneful package. I built the cab myself and they hand finished with a stain and 16 coats of my own wiping varnish. It’s a lot of work man they look great! This custom build is a Vox AC10 Super Reverb. It’s on mean sounding little amp—-kind of a Trainwreck before there were Trainswrecks. It’s unlike most vintage Vox amp. Vox basically lifted schematic off of different companies (the AC30 is a Gibson derived amp) but this one is bit of a mystery. It’s got trem, verb, and I’ve added variable power. The Alinco Weber Silver Bell ready does the amp justice! This was awesome build! It’s a Tweed Harvard with variable power. Steve Cropper is the most famous Harvard user and this little amp definitely has that tone. This Silverface Vibro-Champ came in and I did a bunch of little tweaks, replaced the speaker and added a load box for a line out. It sounds great now! Blues Junior made into a Blonde 20!!! What an improvement!! Here’s cool old Airline amp I restored to health. It was really tough amp to work on and has a lot of inherent flaws in the design. Looks cool though! I am blown away over what I am hearing coming out of my amp. You have more than surpassed my expectations— the tone is outstanding! Jangly, crisp, full, harmonically rich and ear pleasing are some of my initial perceptions.You have transformed my mediocre sounding Super Reverb into something above any amp I have ever heard in this style and beyond. This did not cost much and the results are literally to die for. Custom 1x15 Pine Cab!! Pretty and shipped with cover to prevent dents. I am very impressed by Your inspired work! Colors of sound. I don't need a overdrive pedal! Much Thanks!" This is a Ampeg Revojet....It's a bit of an odd ball but really nice sounding once we fixed the reverb and did few mods to warm it up! This late 50's Alamo amp came in with lots of problems plus they never really sounded to great to begin with (although they look really cool!). We re-capped the amp, re-coned the speaker, replaced some tubes and modified the amp to sound more like a Tweed Deluxe. It's killer little amp now! This vintage Fender Brownface Princeton came in badly needing work. It has little volume, was noisy, the trem thumped and it was distorted sounding. It had been worked on/worked over a few times by a tech and need both corrections to that work and to the little quirks and flaw in how it was wired from the factory. Now it's sounds divine! This was an interesting one off amp: the D Drive. It's Dumble inspired but a single channel (the lead channel) with more flexibility since all those gain trim pots that only tech could adjust are now on the front of the amp. I've implemented a few tricks of my own: the floor noise less than Dumble and Ive made it more touch sensitive. It also has tube buffered FX loop for modulation effects. You had made me the surf-green D-Drive a few months back, and after many hours of practice and three gigs, I have to be honest...IT'S A BEAST. Thank you!!! It reminds me a lot of an old amp that I had that I always regretted letting go of...and now it's back, but better than ever. Thanks so much for your time, Carl! And again, thanks for the D-Drive. It's PHENOMENAL. " Mitchell P.
I rebuilt this Fender Blues Junior in a cool Tweed 5W circuit with a Volume, Tone, Fat Switch and a 5W/1W switch. I also lacquered the cab. Man it sounds great! The perfect bedroom amp. This Custom Blonde 20 was done for customer who wanted single knob reverb and no trem and custom cosmeticss. I did this one quite awhile ago. I converted this old Dean Markley in JTM-45 style amp with single input for each channel. Great sounding amp!! I completely rebuilt this Fender LTD Bassman and modded it for harmonica use. Nice bluesy tones here! It's now cathode biased, the tone controls re-voiced, and a body control added that allow you to go from class A to class A/B sounds which is highly useful for harp players! Fender Pro Junior re-built in Vox AC-15 style circuit!! This vintage Fender Tweed Tremolux came in really needing some work. After restoring the electronics and making new footswitch for it is ready for action. The Trem on it is to die for and the distinctive tweed overdrive is simply fabulous! Fender Blues Junior converted to Supro Style Amp. This Blues Jr. was converted to a 60's Supro 1624T style circuit (not to be confused with the re-issues) I call the the JP Overdrive in honor of Jimmy Page. Crunchy, bright and a perfect for rock and roll! The trem is pre-amp bias wiggle type and sounds really great. 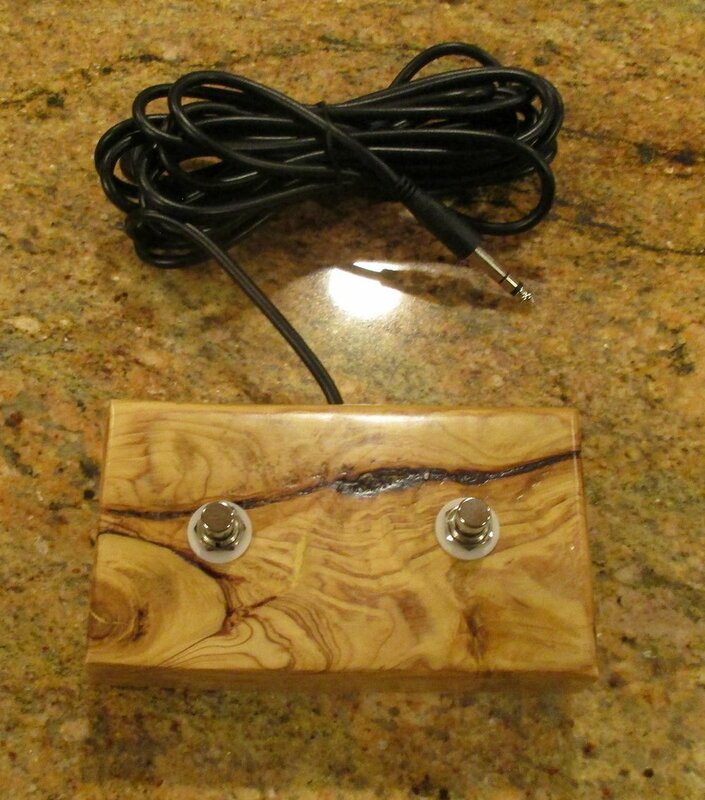 I made cool wooden footswitch for this one. Neatcustom 2x12 Cab with Weber Blue Dog and Silver Bell speaker. The cab is pine with floating baffle lots of great character! Cab like this run about $645. The Clean Machine 40 inwooden cab. I built this custom version of the Fender Blackface Bassman's instrument with added touch sensitivity and mids control. It's great for blues, country, or rock and takes pedals nicely! British Overdrive Custom Plexi! This is one of very coolest custom amps I've ever built and I'm going to start offering them to other customers soon. It's 20W Plexi with a 67', 69', 71' mode, tube/solid state rectifier switch, a power control so it can go down to 1/10W. It can use any common power tube in either a pair or mixed pair. Endless tone possibilities yet completely familiar and classic!! Finally a Plexi anyone can play.
" Carl, I could not be happier with this amp!! Hands down the most versatile amp I've ever owned or played. I've never been able to achieve these amazing Marshall tones with any modern Marshall I've owned or played. It's like I've got Hendrix and Page in a box! Now if only I could play! Thanks again for the amazing amplifier, thank you for your patience in dealing with my multitude of questions and above all thank you for a superior product and your excellent customer service. I will be sending everyone I know your way when they ask about an amplifier. This was cool amp I did a little while ago. It started it's life as Mesa Boogie Blue Angel which was frankly noisy and rather dead sounding. I built a Vox AC-30 with master volume and reverb and numerous circuit improvements to give off the classic jangle and crunch but with less harshness. The speaker was replaced with Weber Alinco Blue Dog. The result is classic! I restored and modded the electronics on this 70's Silverface Bassman with he original 2x15 Cab. It had the dreaded transitional Silverface Bassman circuit that Fender quickly abandoned since sound so bad. I modded it to 60's Blackface specsand she sounds sweet! This Blues Junior was converted in 60s Fender Bassman Circuit with some of Dumbles and my own tweaks. Nice and clean with bluesy smooth overdrive when pushed! Fender Champ 600 modified with a hand wired circuit with grid leak biased octal 6SL7 pre-amp tube. The customer wanted a 40's Jump blues type tone and this delivers! Natural Finish Tweed Super! I can handfinish most of my cabinets for small upcharge. Except in Dec-Feb.
My CPC-40T Tweed Bassman Amp but in a 2X12 Combo Format. Lots of volume and punch with special sweetness from the Weber Alinco 12A150Ts in there. The 1964 Tweed Champ (in a transitional black tolex) came in needing restoration and the speaker needed re-coning. Sounds just as it should now: Awesome! This 60's Fender Bassman came in needing an overhaul. Sounds great now! Fender Vibrochamp Restoration! This Silverface VibroChamp was in bad need of new caps, some new tubes and cleaning. All fixed up it sounds terrific! I made this Ampeg style head for a player wanting smooth Jazz tones. It's got a wide range tone controls, octal 6SL7 pre-amp and 7591 power tubes. With few special touches of my own it yield smooth round vintage sounds and overdrives nicely when cranked. I restored this Mesa Boogie Mark II B. It's an interesting amp and gets that Santana kind of sound as well as Fenderish cleans. The Electro-Voice speaker serves up great sound and can double as a boat anchor. It's certainly it's one of Mesa's better models. It's ridiculously compact and difficult to service due to it's construction. This Octal Princeton was fitted with Power Scalling/VVR control. It can go from 10 w down to 1/10W. There's huge variety of tone with it on board and now you can get power tube breakup at really low volumes!! I recently restored the Silverface Twin and modded it to Blackface Specs. Great 60's Fender sound! This 60W Tweed Deluxe!! This custom order Double Deluxe was made for 4 x6l6GC. It got lots of volume, punch and most importantly great tweed tone! "This is the amp I've been looking for, sounds amazing, a 15 watt plexi with a master volume. 2nd amp I've bought from Carl, I hope he gets as big as he deserves to be one day..and glad i bought a couple amps before he gets discovered and is able to charge twice as much. The Texas Tremolo Amp! It's another one of my tweaked versions of the Fender Brownface Princeton circuit. beautiful warm cleans and great dirt too! I built it with a vintage 60's Conn Organ output transformer. 15 Watts with bias shifting trem. I built this little 5 Watt Octal Pre-Amp Head a while back. It's got a cool rustic look and great overdrive. I restored and modded this Silver Face Fender Bassman. It has a transitional circuit that Fender never even published a schematic for! Octal Princeton with Custom Cosmetics! Cool right! This Bugera was completely re-built into my CPC-5 circuit but with a Wattage and Limit control allowing the amp to go from 5 Watts to 1/10 Watt. You could crank it up and play ultra quiet with very little change in tone! Silverface Super Reverb fully restored to working condition and modded to Blackface specs. Awesome sounding! I called this one the Foxy 15. This chassis uses a slightly modified Vox AC-30 Top Boost Circuit, that's 15 watts and bit smoother. It has a Blues Junior transformer set. It's also got switch that shifts between a tube and solid state rectifier sound which gives you a bit more compression with the amp turned up. Chimey and crunchy! This cool 70's Acoustic 406 2x15 Bass Cab came in needing new speakers. The speaker were replaced with Weber Bass 15s and I added stuffing to the enclosure since they came without it and it a more of a necessity for bass cab. The result: Great vintage bass punch. Great sounding cab! The 1959 High Power Tweed Twin came in for repair. It had some issues but fixed up it's probably the best vintage Fender I have ever played. It's got some strange mistakes made in the factory that give it it's own sound. It's owned by the fantastic Josh Hyde (http://www.joshhyde.com/) who is great player and guy. I was honored to work on it. Be sure to check out his music! Josh also owns my version of Tweed Twin as backup for his touring rig. Fender Custom Shop 57' Low Power Twin that we modded. The circuit has lots of flaws and cheap filter cops that really keep it from sounding good. Fender almost verbatim copied the old schematic without solving all the little problems good techs have been solving for years with these. In addition the voltages were way too high making it really harsh. With some work that map now sounds just as it should: warm, responsive and killer! "Carl, gave it a full out run thru last night, and as expected it sounded fantastic! I can't thank you enough for working with me to get the tone I was after. Your recommendations were rights on point! It sits in that perfect zone for me, more articulate / cleaner than tweeds, but not uber clean with scooped mids like blackface. The clean tone has great vintage vibe & character, and when cranked it has a creamy breakup that never gets ratty or muddy. I really preferred 6L6's as I thought I would, but 6v6 is still really nice. It's going to be loud enough with a 1x12 cab to play with any band I'm in, but not without the ability to turn it up to that sweet spot (2 o'clock for me) and have that "clean with character" tone. Dead quiet, and great natural sustain...no compressor needed. I now need to send the family out for a day trip so I can try it with all my guitars and pedals and really woodshed! If I ever get around to treating myself to another amp (plenty already, but we guitarists all want more) I will hit you up. I've wanted an octal amp for quite some time for harmonica, slide and just straight out of the amp crunch. Tweed Bassman Reissue that came in sounding harsh and hard. The amp was rebuilt with a Classic Tone Output transformer and high quality caps. The voltage was dropped and output tube changed to correct 5881s. The speakers were rewired to play forward like the original Bassman. Now it is warm smooth and musical sounding! Cool 40W Blackface Bassman Style circuit I named the "Clean Machine". It has some tweaks that make it more responsive to the touch. I used some extra large transformers which gave the amp great low end. The British Custom 18 Prototype! 18 Watts of hot roded JCM 800 tone. Really a great amp for hard rock and heavy blues soun€€€ds. Cool old Bogen amp converted to Valco/Supro Supreme!!! It's good a little fat/thin switch and sweet cleans and gritty overdrive. A local player owns this one and regularly gigs with it. CPC-80T Tweed Twin Head in smooth brown tolex by request! Old 60's Alamo amp rebuilt to the CPC-5 circuit. The amp was basically falling apart when it arrive. Now it's a really awesome practice and recording machine. Custom Made Ampeg/Vox Hybrid. Definitely a cool mixture!! Blues Junior turned into Carl's Custom Amps Octal Princeton!! Blues Junior transformed in a Octal Princeton!!! Now it's an amazing amp! I built this one a while back. It's Blackface Vibroverb in Tweed! I used a bias wiggle trem on it instead of the opto-trem. The trem works for both channels!! It's got a Weber Alnico 15" Speaker. Sweet Cleans and deep lows! This Master Volume Silverface Twin Reverb came to me needing some help. I re-capped it, cleaned up tube sockets, and modded the circuit to Blackface Twin specs. I also made a few little changes of my own that I do to all Twins that people rave about. The owner was very pleased with his new amp! I did this one a while back . This little amp was built out of and old Reel to Reel tape recorder. The Tape player did so I converted the amp over to a 5 Watt Tweed Princeton with an El-84 and added an 8 inch speaker. The Meter lights up and moves. Finger Jointed Pine 1X12 Cab. The front and back panels are reclaimed oak! Custom Blonde CPC-40 Amp! 2X10 combo!!! The customer wanted a Blonde 40 Watter but with a custom Oxblood Grill and Alinco 10s. Great Vintage Tone and tremolo. This custom build was really neat. The customer wanted the amp to be aged with a beer ring! It's got modified version of the Blackface Champ (more bite!) in there with a mids control and three way tone switch. This Bogen Head was rebuilt into Dr.Z Route 66 style amp! Big cleans---very neat! I restored this old RCA Tube amp for customer, housed it in a pine head cab and built a custom made extension cab with one 10inch and one 8 inch Weber Speaker!!! Very cool and gritty! Blues Junior Converted to Brownface Princeton minus trem. This one rocks! Warm and clear with great overdrive when turned up! Here's a Vibro-Champ style amp I made custom for customer. Very nice indeed for someone wanting low wattage amp with killer trem! This was really cool build. In fact at some point I'm thinking about making it a regular model. It's 15 watts with a Tweed and British Plexi Channel! Volumes for each chanel, Treble, Mids, Bass, Presence round off the controls. Two 6V6s, a GZ-34, three 12AX7s and a 12AY7. It's got great sounding Weber Sliver Bell in it. This was a really cool amp! It's a Supro Supreme Style circuit with octal preamp tubes but with the ability to use 6L6 and 6V6 tubes, a on board power attenuator, a Weber 15" 15F150-O. Fender Pro Junior Rebuilt into a Vox AC15 Style Circuit! This Custom Bass Amp is based around the famous Ampeg Portaflex but with a 100 watt power section, a mid shift control, bypass-able Master Volume and Fat Switch. I hardwired this Princeton Reverb RI upgrading the parts, adding a master volume, adding a extension cab to make cool mini stack! The customer really loved it! This one was built for a customer that wanted to get a Blues Breaker sound and trem without too many knobs. It has high and low gain settings, tone, volume, master, speed and depth controls, a built in attenuator plus some great looks! 40 watts with KT66's this thing has plenty of power! This Fender Super 60 (horrible sounding) was converted into a Jim Kelly Style amp. The Owner loves it! This Bandmaster Reverb belonged to a customer's grandfather. It was in really rough shape with the cab falling apart. It took lots of TLC to restore but it was well worth it. Great amp! This Bogen PA was once used as a school intercom. Where the bolts are now had buttons for different class rooms. Funnily enough the inside was a lot like a Champ. I made it in a Tweed Princeton with a 6L6 output! Vintage Fender Super Reverb that I worked on. It was in desperate need of of new caps and tubes. Gorgeous clean tone through those Alinco Speakers. Bogen Deluxe/Supreme Conversion Amp. This one has a 6 way voicing switch that goes fro slicing treble to Bassman thick! Valco Supreme Style amp. 15 Watts. Great gritty blues tones from is all octal tube compliment. Nothing quite like it! Inside of the Custom Supreme. True point to point wiring. Custom built 3x10 combo amp. It's a hybrid of JCM 800 and Tiny Terror circuitry with some twists. 2XEL-34, a GZ-34, and 2 X 12AX7s. Mean British Punch! I built this 3X10 cab custom for guy who tours with a Fender Super Reverb that was converted into a head. It's got two Weber 10A125 Alnico speakers and a Ceramic WGS. Very cool looking and sounding! I converted this old Kodak Slide Programmer pre-amp into a high quality bass and guitar pre-amp. It has volume, tone and bass boost switch for controls. The new owner hooks it up to old solid state bass amp and was thrilled at the great tone! A customer brought in this vintage Fender Vibrolux for restoration. When it arrived it really sounded poorly. It was re-capped, re-tubed, a three prong cord added and few resistors changed. Now it sounds amazing! 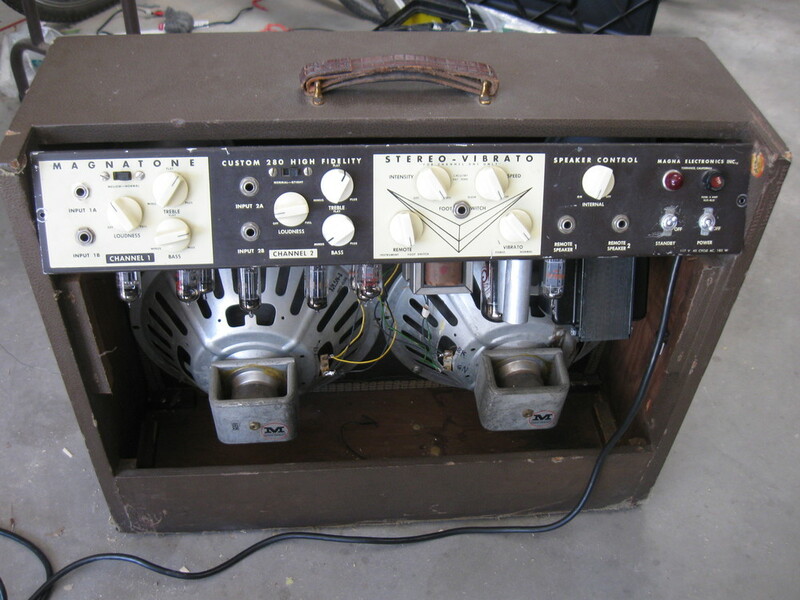 This Robert's Tape Recorder Unit was turned in a Tweed Princeton style head but with El-84 power tube and 6X4 Rectifier. Tweedy but with Jangle! This Mike Matthews Freedom Amp came in. The Cab was shot---and the caps were bad. I built a new cab and re-capped and voilà better than new! Magnatone Custom 280 that needed lots of help. This amp had true pitch shifting vibrato! Working Great now! Fender Brownface Pro. It came in as just a chassis and a non-original cab. Once a few components were switched out, it was re-tubed, the grill cloth was replaced, casters were added and a Weber 50 Watt Alnico Speaker was put in. Man this thing was cool! I installed a no loss FX Loop and corrected a few mistakes in this custom made Marshall Plexi Style amp. The owner now loves it! This Silverface Princeton Reverb came in and looked as if it had been under water! I stripped it down and built a new circuit to Balckface Specs! Here's the amp complete in cabinet! Custom made head with 20 Watt Blonde Bassman Circuit with bias shifting Tremolo. I made the cabs too! This was another custom build. The customer wanted a Supro type amp but with more power and more versatility. 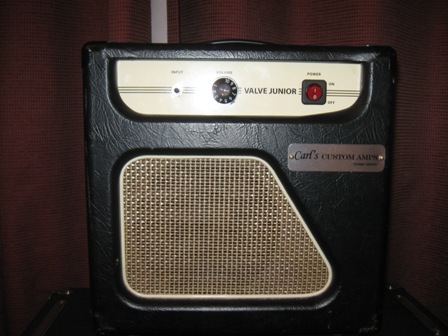 This one has a Valco Supreme channel with a 6J7 and a mid fifties Valco channel with a 6Sl7. A 6SL7 was used for the phase inverter and a 5U4 was the rectifer. Also has a gain switch. Very cool amp with sweet cleans and beefy overdrive. Octal Princeton with Natural Finish TV front Pine Cab. This vintage Supro Thunderbolt came to me completely trashed. The owner had found it. After hearing about my Thundergod Amp he sent it in to be restored! Fixed up and ready to rock! Inside of a non-working Supro Thunderbolt! Blues Pro Junior Cab retro fitted for a 5F1 Tweed Champ Chassis! If you have played a Pro Junior they are kind of disappointing. If you've played a Champ you know no one walks away unimpressed! Lame to insane! Another Pro Junior Retro-Fit. this time it has Supro style circuit with single 6L6 for 10 watts of power. Crunchy and mean sounding! Trainwreck Liverpool style amp! 30 watt of twang and crunch! 18 Watt Lite prototype in a Pine head cab! Ampeg B15N single channel style amp. Its the perfect bass recording and small gig amp. I has two 6Sl7s, Two 6l6s and a 5U4 rectifer. This Silverface Champ came in badly needing a re-cap. I also removed the tone sucking snubbing cab this model had. Interestingly the transformers are much nicer than the Blackface ones. Really sounded great when I was done! This amp was once a Fender Pro Junior. I stripped it down and built a single channel version of a 1624T Supro. Great overdrive from those 6973 power tubes! Gut shot of the rebuilt Pro Junior!